In a manifestation of growth, innovation and forward progress in the Lynchburg business community, the Lynchburg Regional Business Alliance moved in to its new state-of-the-art headquarters last October, marking the beginning of a new era for the organization. And now, after months settling in and a year of overseeing renovations, CEO Megan Lucas is looking for more ways to utilize the building to create a new catalyst of large revenue streams and wider profit margins in the greater Lynchburg area. The new headquarters, which was previously used as an old U.S. Postal Service sorting facility and later as an event center, sits on a hill at the end of Lucado Place in downtown Lynchburg, overlooking 5th Street and Rivermont Avenue. Ever since the Alliance acquired the building last year, Lucas has been at the helm of major renovations to make the location a warm and welcoming environment for local business leaders. As Lucas toured through the halls of the new headquarters, she excitedly pointed to places where construction workers tore down walls to make extra space, where old “casino carpet” was ripped up to place new flooring, and professionally-designed meeting areas where she imagines Lynchburg-area business leaders discussing big ideas. Every change that was made to the building, Lucas said, was made to capture the essence of the innovative and burgeoning industrial landscape of the Lynchburg region. Before its move to Lucado Place, the Alliance headquarters was at a smaller, limited facility of only 8,500 square feet that Lucas said was run down and outdated. When she would bring in clients from other cities, Lucas said she would commonly invite them to meet at a local company’s headquarters, worried that meeting at the Memorial Avenue location would give off a bad first impression. At the new location, though, large windows give way to vibrant, curvy walls and modern flooring. Large flat screen TVs are hung on the walls with rotating slides of information about the Alliance. Large hallways lead visitors and members alike to professionally equipped office spaces and meeting rooms. In the back, a large, open wooden porch gives view to Lynchburg’s cityscape and the James River. Now, when representatives who are thinking of moving their business to the Lynchburg area come to visit, Lucas and her staff can proudly welcome them at their new location, being confident that the building itself is a representation of the city’s business community as a whole. Everything about the building, according to Lucas, was constructed in such a way to exhibit the character and growth of the Lynchburg business community. There is a small alcove filled with student artwork from local colleges; another spot is set to display images of items that are manufactured in the region. Large wooden “tobacco barn” doors—which are a tribute to the Lynchburg area’s history in the tobacco industry—mark the entrance to the receptionist’s desk at the front end of the building. In all, the new headquarters is about 25,000 square feet and gives the LRBA’s approximate 800 member companies a new place to call home. 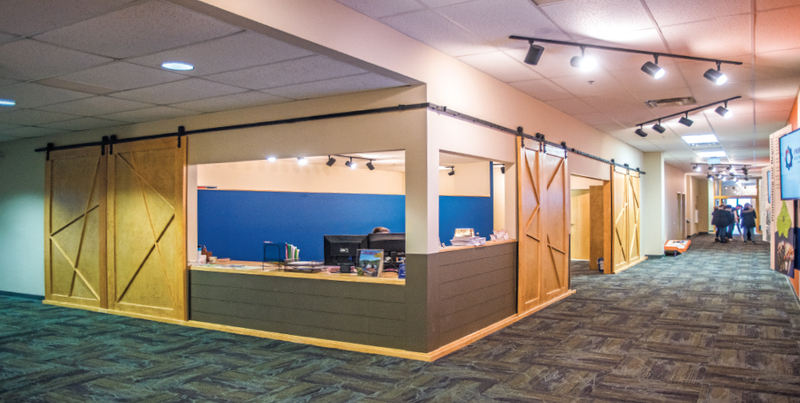 Along with updating the overall look and feel of the building, Lucas and her staff have outfitted it with a 400-seat conference center, a member lounge, an executive boardroom and multiple office spaces that members can rent and use. “If a member is in between meetings or needs to get out of their office, or if a member from Bedford, Amherst, Campbell or Appomattox comes in for a meeting—we have members from everywhere across the region—and doesn’t want to go back to their office, we have made it so they can use our space to get their work done,” Lucas said. The renovations to the building, she said, were 100 percent financed by donations from local companies and organizations from industries across the spectrum, making the headquarters not only built for the business community, but also built by the business community. The names of all of the donating companies are proudly tacked to the wall at the entrance with gold tiles; without their support, Lucas said, the entire renovating process would not have been possible. “And we’re not done renovating yet, so if a company comes in and wants to get their name on the wall and become a part in all of this, we are still accepting donations,” Lucas said. Still-to-come features include sliding walls that will eventually be put in the conference room so it can be used for two events at the same time, and dry erase walls will be added to the boardroom to give corporate executives more flexibility in how they plan and conduct their meetings. Outside on the terrace, Lucas said she imagines a well-kept public garden with a serpentine path leading up to the back entrance of the building. At the heart of all the changes to the building is a mission to best serve the businesses of all industries— from manufacturing to nuclear energy and higher education—in the greater Lynchburg region. While walking through the finished and pristine parts of the facility, Lucas was focused on how each aspect of the building will benefit and welcome local business leaders. Because for the Alliance staff, the move to their state-of-the-art facility is the fruition of the progress and resiliency that the area’s business community has displayed over the past decade. Statistics from the U.S. Bureau of Economic Analysis show that Lynchburg’s gross domestic product grew by 15 percent from 2008 to 2016, and Lucas said the plethora of ribbon cutting ceremonies for local small business openings shows a piece of the bigger picture: a business community that continues to be on the rise. “When you think about the businesses that call the Lynchburg region their home, like BWX Technologies, Glad and Abbott Nutrition, it becomes clear that the caliber of businesses and manufacturers that we have in this region is quite amazing,” Lucas said. To help bolster area business and drive growth, the Alliance helps small and large companies alike in the area with services such as lobbying for their interests in Congress to helping them make their company more marketable and securing a talent pipeline—all while also attracting new businesses to the area to foster a healthy economic climate. Following the Alliance’s recent annual meeting for 2018 that was held at their new location, Lucas said her organization still remains focused more than ever before on tackling emerging obstacles for area businesses and acting as a stepping stone for young businesses and startups. “What we really want local businesses to know is that they are never alone,” Lucas said. Lucas was steadfast in saying that the new headquarters does not change this message, but rather bolsters it. The four-year CEO, sitting in her new office that itself is filled with keepsakes and images from the local business community, said that even after all of the new changes she and her staff has overseen in the past year, she cannot wait to see what is next.